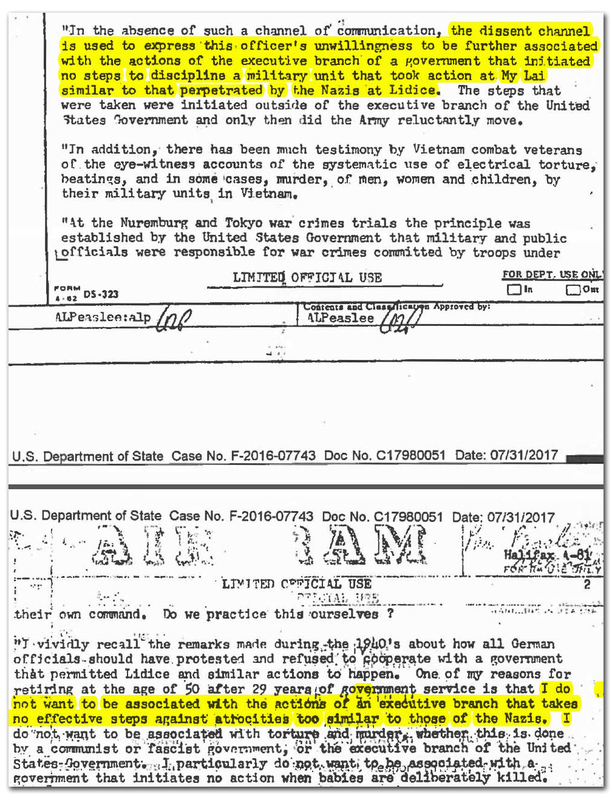 Foreign Service Officer Protests of: US Inaction over My Lai atrocities “similar to those of Nazis;” “Selective Genocide” in Bangladesh and Burundi; Cooking the Books on Vietnam Intelligence; and US Policy towards the USSR, China, and the World. Responses to Dissent Cables from Policy Planning Staff including from Tony Lake, Warren Christopher, Paul Wolfowitz. Washington D.C., March 15, 2018 - A US Foreign Service officer warned that “blatantly illegal” Congressional requests, including the use of a diplomatic pouch to smuggle gemstones and utilizing embassy employees for the “soliciting of female companionship,” were harming “the personal integrity of employees of the Department of State,” according to a Dissent Channel cable newly released to the National Security Archive after a Freedom of Information Act lawsuit. 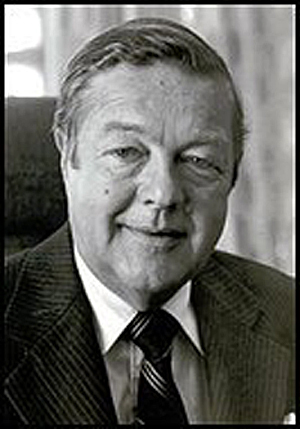 A dissent over the “hypocritical” US support of the Somoza regime in Nicaragua, bemoaning that the US missed a “unique opportunity … to intervene for once on the right repeat right side” of history. In the words of one now-declassified cable, “The Dissent Channel can be a mechanism for unclogging the Department’s constipated paper flow” related to pressing employee dissent against current foreign policy actions. The Director of Policy Planning for State is responsible for “providing a substitutive reply, normally within 30-60 working days.”The responses to the critiques posted today are drafted by high level diplomats including Anthony Lake, Warren Christopher, and Paul Wolfowitz. The Dissent Channel remains in active use today. In January 2017, nearly 1,000 State Department Foreign Service officers and civil service members signed a document transmitted through the Dissent Channel in opposition to an executive order signed by President Trump halting the issuance of visas to people from seven Muslim countries. The dissent, which has been published, states, that the executive order “runs counter to core American values of nondiscrimination, fair play, and extending a warm welcome to foreign visitor and immigrants.” Moreover, “[t]he end result of this ban will not be a drop in terror attacks in the United States; rather, it will be a drop in international good will towards Americans and a threat towards our economy.” The text or existence of any Policy Planning response to this Dissent has not been made public. 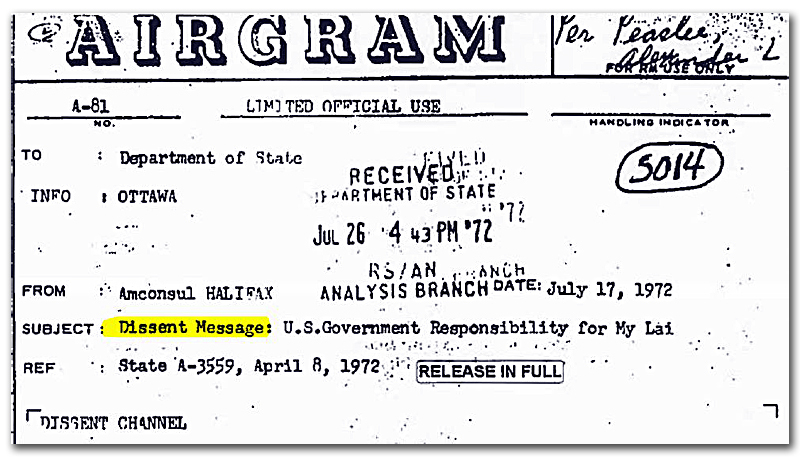 Allegedly inaccurate intelligence reported by the Ambassador to South Vietnam. 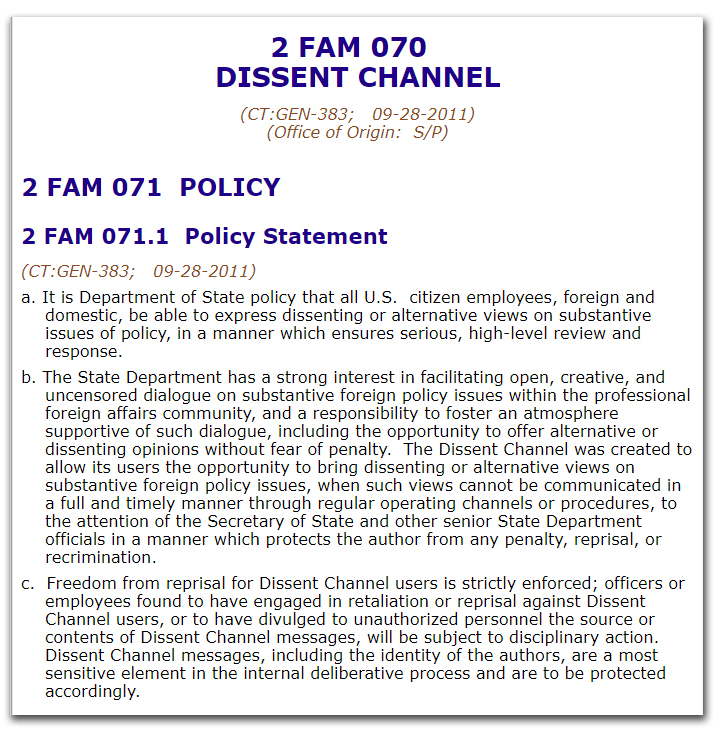 The Foreign Affairs Manual 2 FAM 070 which governs the use of the Dissent Channel. 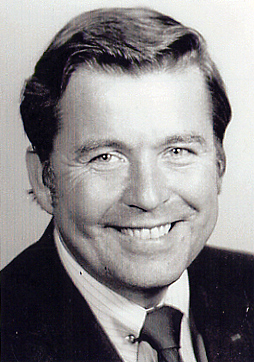 Archer Blood, author of the first known Dissent Cable on "genocide" in East Pakistan. From the Association for Diplomatic Studies and Training. 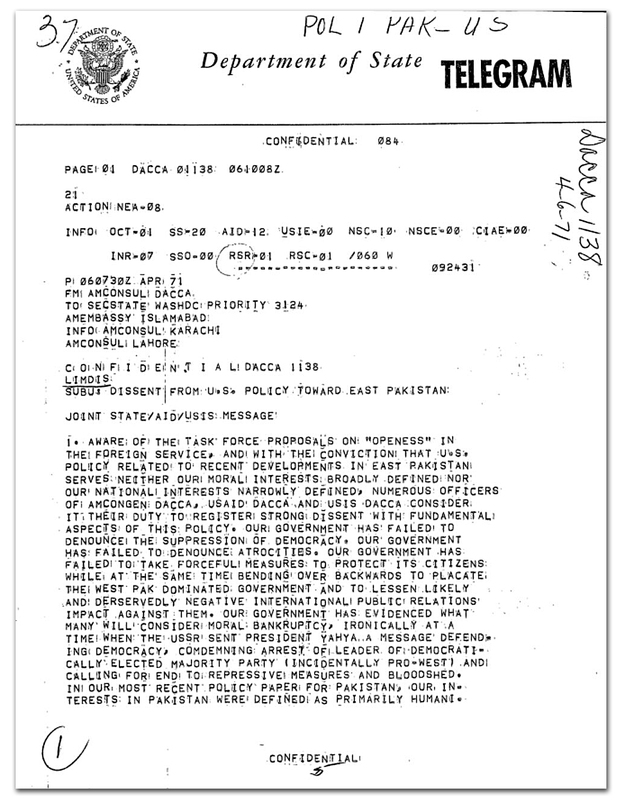 The first known Dissent Cable describing "genocide" in East Pakistan (Bangladesh). Unlike most of the documents released by the State Department in our lawsuit, the names and signatures on this cable are unredacted. Dissent channel memorandum condemning the inaction of the executive branch "to discipline a military unit that took action at My Lai." 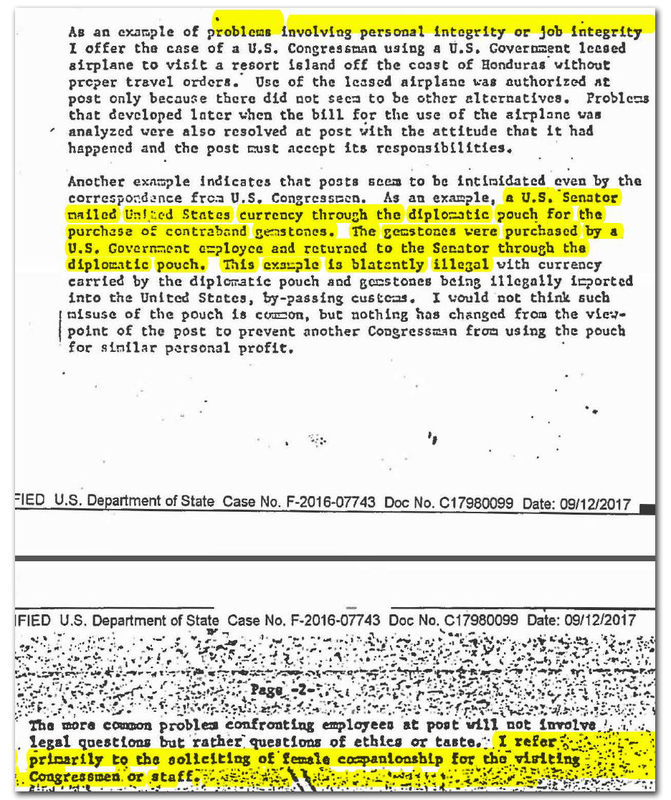 Dissent Channel memorandum from Honduras describing "problems involving personal integrity" including the use of the diplomatic pouch by a senator to smuggle gemstones and the utilization of embassy employees for the "soliciting of female companionship." 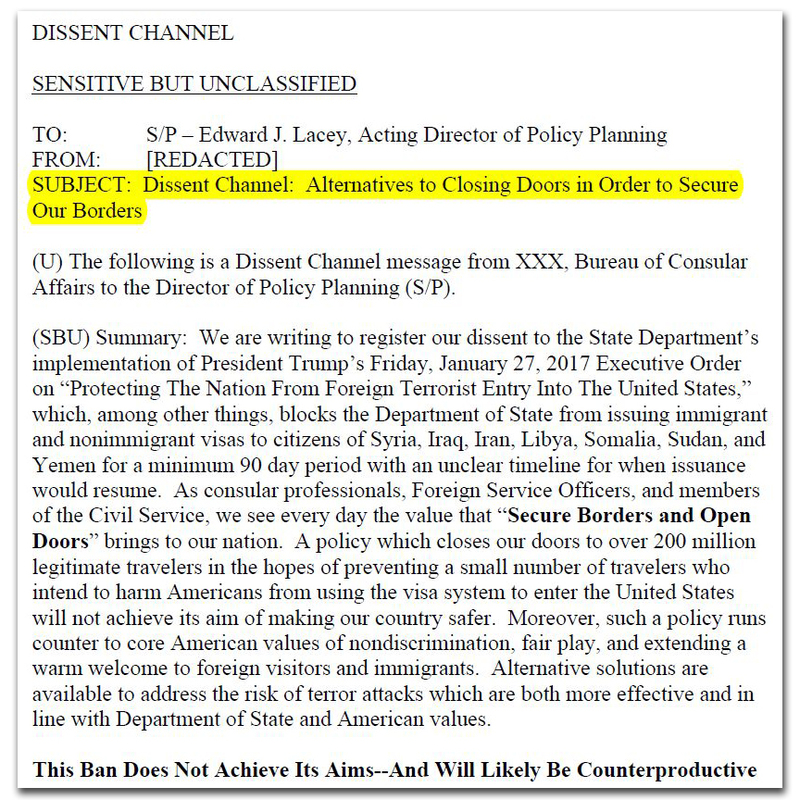 The most recently known dissent, signed by nearly 1,000 State Department employees denouncing a Trump administration's "Muslim Travel Ban" executive order. Thomas Boyatt, “What if I Disagree? Dissent in the Foreign Service,” excerpted from Inside a U.S. Embassy, 2011. Boyatt also includes helpful instructions on how to best draft and argue a dissent.